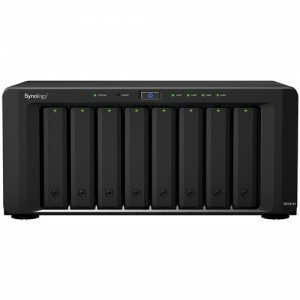 The DiskStation DS215+ 2-Bay Diskless NAS Server from Synology offers high performance, energy efficiency, and complete business features in a network attached storage solution. 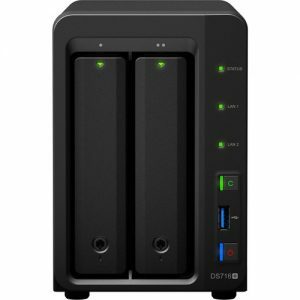 Designed for multitasking applications, the DS215+ helps small and medium businesses centralize backup, protect critical assets, and share files quickly and efficiently. 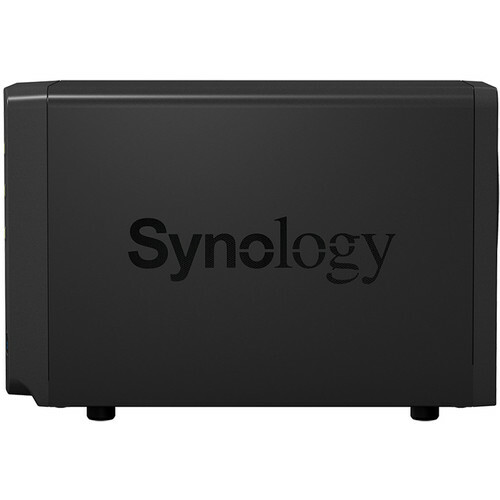 Natively equipped with two drive bays that are capable of supporting 3.5″ and 2.5″ SATA III 6 Gb/s and SATA II 3 Gb/s hard drives and SSDs, the DS215+ will allow you to store and share a large number of files, including videos, music, photos, and documents with up to 2,048 users. 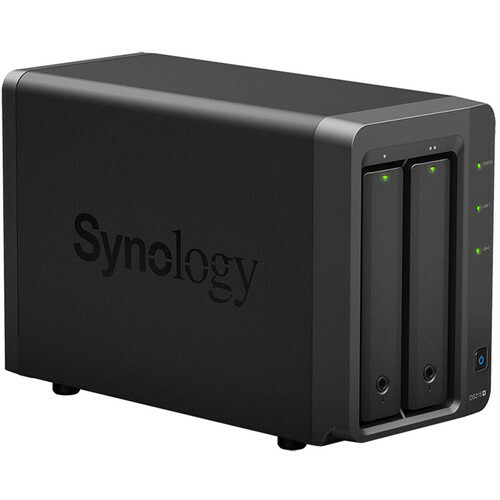 It may also be configured as RAID 0, RAID 1, Synology Hybrid RAID, Basic RAID, or JBOD. 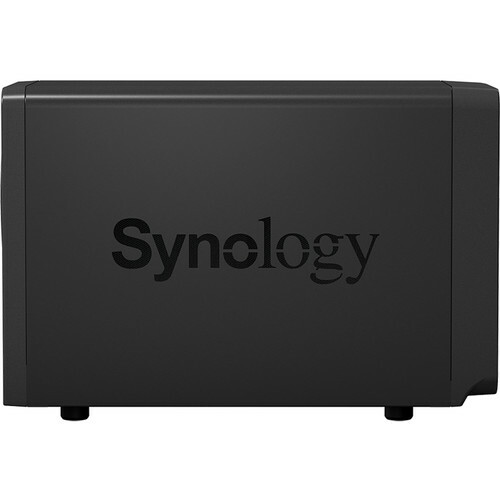 The DS215+ runs using the Synology DiskStation Manager (DSM) OS, which is a browser-based operating system which helps to simplify managing your Synology NAS. Its CPU is a 1.4 GHz Annapurna AL-212 Dual-Core processor and its 1GB of DDR3 RAM allows frequently-used files to be quickly accessed. 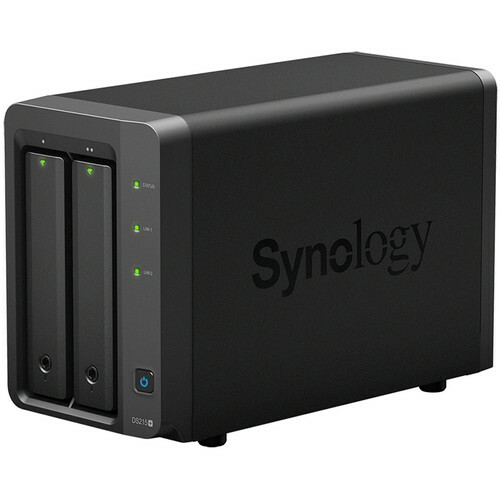 When configured as RAID 1 and operating in a Windows environment, the DS215+ is capable of achieving read speeds of over 209 MB/s and write speeds of over 139 MB/s. When the dedicated hardware engine is equipped, the DS215+ is still able to achieve read speeds of over 145 MB/s and write speeds of over 71 MB/s. 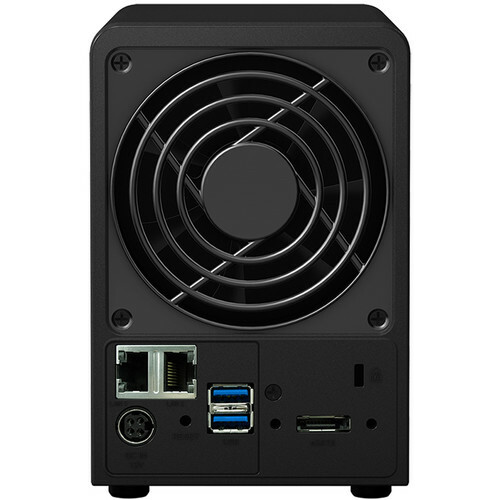 It also features 2 x USB 3.0 ports and 1 x eSATA port which allow it to be connected to your Windows, Mac, or Linux system. Internet connectivity is achieved via dual Gigabit Ethernet ports, which in addition to having failover and Link Aggregation support, also allows your stored data to be shared with users throughout the network. Data may also be made remotely available through the free iOS and Android application DS cloud. The DS215+ is also engineered to be energy efficient. Not only does it offer a larger 92 x 92mm fan and smart airflow to help keep the system running cool at all times, its noise dampening design of 19.2 dB(A) makes for quiet operation. 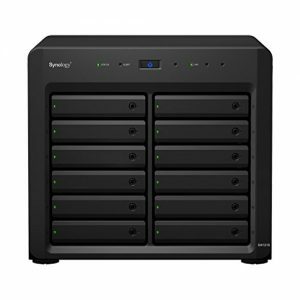 The server supports numerous scheduled power on / off cycles and hard drive hibernation to further minimize power consumption and operation expenses. The DS215+ operates on 100-240 VAC at 50/60 Hz (single phase) and includes an accessory pack, an AC Adapter, an AC power cord, and 2 x RJ-45 LAN cables.